I referred a friend; he signed up – we did not get the credits! Why? My friend got the reward, but I did not. Why so? My friend has done 5 transactions, but I am not getting my rewards. Why? and many such typical questions which are common occurrences when you run Growth Hacks that offer incentives to your users. Most of these instances are of users who are angry or disgruntled, and they rarely understand that a mistake/miss on their part would have caused this. Some of these users may even submit negative reviews on the Play/App Store, or spread bad reputation on social media. This feature is to help you prevent and protect from such situations. AppVirality has a very strong fraud prevention mechanism in place. It protects your app from any fraud activities or users who may want to game your growth hack campaign to earn extra credits. Sometimes when such fraudsters try different techniques to earn extra credits unethically, we take preventative measures like block such users, mark friends as Suspicious, etc. These above is just the tip of the iceberg. There could be just many such variations. In such situations where attribution was not done and users were not rewarded, you can attribute the users by clicking on “Attribute manually” and reward the users from the query resolution itself by invoking the conversion event. Why Rewards to Certain Users may have been Skipped! This feature works as a quick fix for your User Relationship Management. Whenever some user cites such issues as have been stated at the top of this post, you would need to get two things from them. Here you would need to enter the Referrer & Friend Details as applicable in the given fields. If the condition is satisfied, we display tick mark with the green circle else we cross mark with the red circle. you can invoke conversion events by clicking on Invoke button for the event. Click on Invoke button for the transaction event then rewards for the users gets distributed based on the rewards configured in the campaign. The Info button (green info icon) against each of these users would give you a detailed info on each user. When the users(friend and referrer) use same emails or same devices then we consider the referrals as self-referrals. Enter referrer email id/referral code and friend email id in the Query resolution.Click on Find resolution button. The error message will be displayed as shown in below image. Sometimes the friend will not enter referral code or will not click on the referral link. In these cases, we will see the error message as shown in below video. You can attribute friend to the referrer from the query resolution by clicking on “Attribute Manually” button. 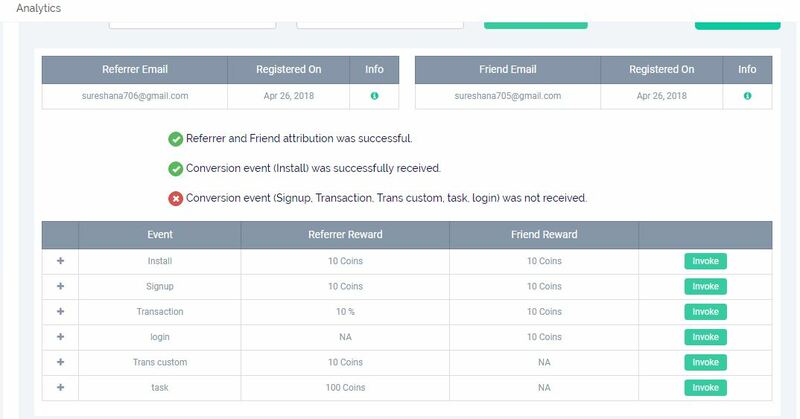 After getting attributed successfully, you can invoke conversion events by clicking on Invoke button for the event and rewards will be distributed to users based on the reward value configured for the event in the campaign. Sometimes a friend might already be attributed to the referrer. if the friend enters referral code of another referrer or clicks on another referral link, in these cases attribution will not happen again and rewards will not be given to the new referrer. We display a message saying “Friend is already attributed to ‘user email'”. When a friend is marked as an existing user then he will not be rewarded. In such case, attribution will not be done and friend is marked as an existing user. In this case, you can manually attribute from query resolution. Enter Referrer and friend emails and click on “Find Resolution” button. After displaying the error messages, you will see the “Attribute Manually” button. Click on Attribute Manually button, attribution will be done for the users. Click on Invoke button corresponding to event then the conversion event on the respective event is triggered and rewards will be distributed. Sometimes, as stated earlier, specific fraudulent behavior by certain Referrers leads for them to be Blocked by the system. This occurs primarily when a Referrer has at least 5 Friends or more, who have been tagged as Suspicious. In this case, if you invoke the conversion event then it will display the message saying “user is marked as Blocked/Suspicious. Rewards will be marked as suspicious”. Conversion event will be invoked and rewards will be marked as suspicious. Often, users click on referral link in one network and install the app on another network. When such an instance takes place, the IP addresses recorded during the Link Click and install are different. This leads to an IP mismatch for attribution & a solely link based Referral program would reject the attribution. In this case, also by clicking on Attribute Manually button, attribution will be done for the users. You can invoke conversion events by clicking on Invoke button for the corresponding event. Users will receive rewards based on campaign reward rules. New users who try to game the system may resort to malpractices which may include using devices with invalid Hardware IDs or any of the fraud checks turned ON. In such cases, we will identify the user as suspicious and the rewards for the user will be marked as suspicious. Rewards would stop flowing to the Referrer when he has reached the maximum reward capacity i.e. the Redemption Cap for a particular campaign. This will not be applicable for Friend. In this case, if you invoke conversion event then reward will be distributed to the only friend. Often we see that users send their referral invites to a bunch of their friends, rarely knowing that some of them may have already been using the app. In such cases, the Friend may try to re-install the app using the newly obtained invite, in hope of some credits. AppVirality makes it a point to prevent such cases from eroding your rewards, primarily because the user was originally pre-registered. The users will not be rewarded then. In this case, by clicking on Attribute Manually button, attribution will be done for the users. You can invoke conversion events by clicking on Invoke button for the corresponding event and rewards will be distributed as per the campaign. When any of the conversion events are not received (events added in the campaign), we will display the conversion events which are not received. You can invoke conversion events by clicking on Invoke button for the corresponding event and rewards will be distributed as per the campaign. The above are a few of the many examples of how many scenarios can be clarified using this tool/feature. Another case is where the Friend may have installed the app upon getting the invite – but clicked on the referral link after the install was done. This is a clear case of attribution mismatch, and cannot be helped with. The system shall not reward either of the parties in such an instance. Bulk query resolution is very helpful for the support team to check more than one referral query at a time instead of checking each query manually one after the other. You can upload all the queries related to referral at once instead of searching one by one. Upload a CSV file with “Referrer Email or Referral Code” and “Friend Email” by clicking on “Bulk upload” button in the query resolution. Once the file is processed you will receive a mail with the download link to the file containing results. After uploading CSV file you can see the exported file by clicking on “Exported Files”.